Open daily, 10 a.m.-5 p.m.
Cavalier Surf Shop in Nags Head has been a much-loved resource for local and visiting surfers since it was founded in the early 1960s … Yes, the 60s! Located at Milepost 13 on the beach road, we are the Outer Banks’ original surf shop - and a worthy destination for that fact alone. Whether you’re a waverider or a gift shopper, or you’re just looking to lay eyes on a local icon, there’s good reason to come see us. 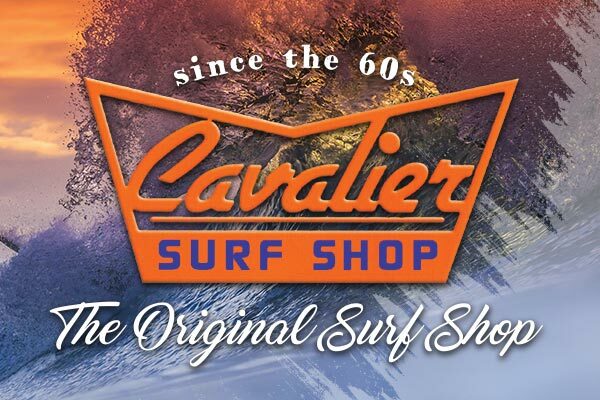 In addition to a storied history, Cavalier Surf Shop offers a quality assortment of surf and skate equipment, accessories and apparel, as well as general beach gear and some fun novelties. You’ll find some of the best prices on new and used surfboards, skimboards, bodyboards, skateboards, balance boards and stand up paddleboards. Other inventory includes wetsuits, men's and women's swimwear, bags, blankets, custom hats and t-shirts, sandals and flip-flops, sunglasses, casual jewelry, stickers, incense and lotions… The list goes on. We have rentals too! Grab a surf, skim, body or SUP board to play around on, and maybe a wetsuit to keep you warm in the process. Chairs and umbrellas are also available. Owned and run by a fun-loving local family, Cavalier Surf Shop is here to satisfy all of your Outer Banks surfing needs.